After three effective working days in Hanoi from March 29-31, the sixth Greater Mekong Subregion Summit (GMS-6) and the 10th Cambodia-Laos-Vietnam Summit on Development Triangle Area (CLV-10) wrapped up successfully, demonstrating the aspirations and determination of GMS countries in building a Mekong subregion of peace, prosperity, and sustainable development for the people. Attending the events were representatives from the governments and localities of the GMS member nations, development partners, experts and businesses inside and outside the subregion. 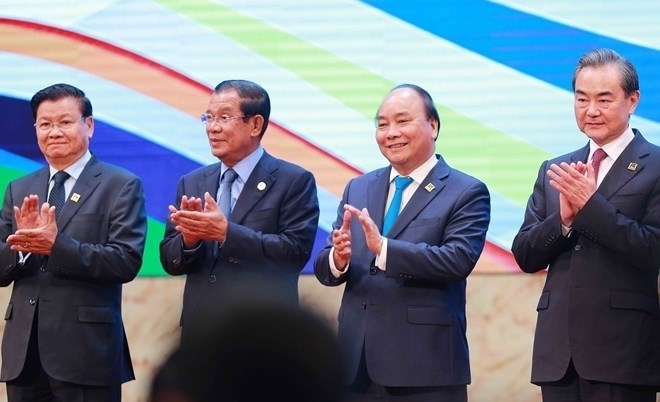 In his opening speech at the GMS-6, Prime Minister Nguyen Xuan Phuc of the host, Vietnam, said that after a quarter of a century, the GMS cooperation has ceaselessly developed in both depth and width, affirming its own identity as a prestigious regional cooperation mechanism with a “3C” Strategy of Connectivity, Community and Competitiveness. Hundreds of projects with a total capital of more than US$21 billion have been implemented in various fields from transport, energy and telecommunication to trade, agriculture and environment. The GMS has become a dynamic and integrated region which is now home to the fastest growing economies in the world. To promote the strong engagement of development partners, especially the private sector, in the GMS cooperation program, Vietnam initiated the organization of the first-ever GMS Business Summit as part of the GMS-6 to strengthen dialogues between the State and businesses and to connect GMS enterprises with global partners. This initiative received overwhelming consensus from other GMS member nations and warm support from development partners including the Asian Development Bank (ADB), the World Bank (WB), and the Association of Southeast Asian Nations (ASEAN). The subregion’s leaders adopted three important documents including the Joint Statement of the sixth GMS Summit which affirms the countries’ political commitment and determination to increase the role of the cooperation mechanism; the Hanoi Action Plan for 2018-2022 defining major collaborative orientations and measures in key fields for the coming time; and the Regional Investment Framework 2022 providing a list of more than 220 projects worth about US$66 billion. They also look to build a post-2022 cooperation vision in the long run and realise the Sustainable Development Goals of the UN 2030 Agenda given the significant changes occurring in the region and around the world. The GMS cooperation programme needs to define a long-term vision to build a prosperous and integrated subregion and ensure a sustainable, harmonious, and balanced development as well as promote inclusive growth in the region. It must also ensure that all people enjoy the benefits of globalisation and the fourth Industrial Revolution. The GMS was established in 1992 as an initiative of the Asian Development Bank (ADB). The GMS Programme is the most complete cooperation programme to involve Vietnam, Laos, Cambodia, Thailand, Myanmar, and China’s Yunnan and Guangxi provinces. It aims to facilitate and promote win-win economic cooperation among the GMS countries. 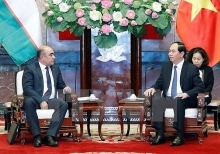 Vietnam has actively taken part in developing initiatives for enhanced cooperation in the GMS as part of efforts to boost economic growth, strengthen economic connectivity, and aid poverty reduction in the region. Vietnam signed the GMS Cross-Border Transport Facilitation Agreement (CBTA) in 1999 and has ratified all of the CBTA’s annexes, leading toa reduction in time spent crossing borders for vehicles, goods, and passengers, and facilitating trade. Since 2012, Vietnam and China have facilitated each other’s vehicles crossing shared borders on the Kunming – Hanoi – Hai Phong and Hanoi – Nanning – Shenzhen routes. The 10th Cambodia-Laos-Vietnam Summit on Development Triangle Area (CLV-10) reviewed the implementation of a master plan on regional socio-economic development for the 2010-2020 period and mapped out cooperation orientations for the coming time, especially in embracing trilateral economic links. This was the first time leaders of the Asian Development Bank (ADB), the World Bank (WB), and the Association of Southeast Asian Nations (ASEAN) had participated at the summit. The CLV leaders recognized progress made in trilateral cooperation over the recent pastin wide-ranging fields from infrastructure to trade facilitation. They stressed the importance of the CLV cooperation in maintaining peace and stability in the region, supporting socio-economic development in each country, and helping 13 border provinces to narrow the development gaps. At the summit, the CLV leaders reiterated their commitment to promoting comprehensive cooperation between the three countries, and contributing to the building of integrated, sustainable and prosperous economies in the development triangle area, which is an indispensable part of the ASEAN Community Vision 2025. They emphasised the need to strengthen connectivity between the three economies to increase their competitiveness and effective involvement in regional and global value chains and cope with common challenges. The leaders discussed the expansion of the CLV Development Triangle Area to cover the entirety of the three nations, as it currently only includes the 13 border provinces, and agreed to entrust ministers and experts to study this issue. The three PMs approved a master plan for CLV connectivity until 2030, which covers major orientations for boosting infrastructure, institutional, economic and people-to-people exchange connectivity. The CLV Development Triangle Area was established in 1999, covering Vietnam’s Kon Tum, Gia Lai, Dak Lak, DakNong provinces; Laos’ Sekong, Attapeu and Saravan provinces; and Cambodia’s Stung Treng, Rattanak Kiri, and Mondul Kiri. In 2009, the three countries agreed to add Vietnam’s BinhPhuoc province, Cambodia’s Kratie province, and Laos’ Champasak province to the area. Its cooperation focuses on the fields of security, external affairs, transport, industry, agriculture, trade, investment, and environmental protection. The establishment of the CLV Development Triangle Area aims to strengthen solidarity and cooperation between the three countries to ensure security and political stability, reduce poverty, and develop the region’s economy. The CLV cooperation focuses on security, external affairs, transport, industry, agriculture, trade, investment, social affairs, and environmental protection. The successful hosting of the GMS-6 and CLV-10, one of the country’s most important multilateral external events in 2018, demonstrates the exalted role and position of Vietnam in the region, as well as its active contributions to regional cooperation mechanisms.